I’m really enjoying this book so far. More about it tomorrow. 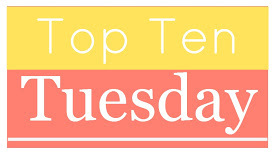 Top Ten Tuesday is hosted every week by “The Broke and the Bookish.” This is a fun topic this week. We all get excited when our favorite books get optioned into movies, but it’s really difficult to do. Here are a few books that I would love to see as movies, as long as they could get it right. 1. The Belgariad series by David Eddings – This is a favorite topic over at the Mallorean Tavern. We love discussing casting, picking actors to play our favorite characters. This would be a big undertaking, so maybe this would be better as a TV series. 2. The Harry Potter series by J.K. Rowling – Okay, this will take some explaining. Yes, there are already movies, but I really wish they would do a TV version of the series. Actually, I think a day to day Hogwarts cartoon would be fun. Magic and hijinks. Wouldn’t that be fun! 3. The Iron Fey series by Julie Kagawa – I really want to see how they would do the Never Never. Also, we get to have a magical talking cat. And two really good looking guys. 4. Paper Towns by John Green – I’m really glad that they’re making The Fault in our Stars into a movie, but I’d really like to see them take a stab at Paper Towns. 5. A Great and Terrible Beauty by Libba Bray – It would be nice to see this whole series made into a movie. Not only do you have a fun fantasy story, but you get to have all those great Victorian costumes as well. 6. The Dragonriders of Pern series by Anne McCaffery – Short and sweet, I want to see dragons! Lots and lots of dragons! 7. Good Omens by Neil Gaiman and Terry Pratchett – This one would probably be a challenge, but I’d like to see them try. A lot would depend on casting – you would need a really good Crowley and Aziraphale, or the whole thing would fall apart. 8. Anna Dressed in Blood by Kendare Blake – This one has so many amazing visuals, both beautiful and terrifying. I think it would translate to screen well. 9. The Name of the Star by Maureen Johnson – Combining a ghost story and a murder mystery, this one would be exciting as a movie. They’d have to keep a lot of the dialogue though, since that attitude is part of what makes the book fun. 10. Lola and the Boy Next Door by Stephanie Perkins – I was debating between this one and Anna and the French Kiss, but I definitely wanted one of them on this list so we could do a nice romantic comedy. I ended up with Lola because of her costumes. That would be fun. Please leave links to your teasers and top tens in comments! Paper Towns would definitely be an interesting choice! It could just be that I love the book so much. But I think it would make a funny, yet moving movie. Especially if they did it right. Papertowns is one of my favourite John Green books, hopefully once TFioS is done they’ll start going through his back catalogue! TFioS looks like it’s going to be amazing. I’ve been watching some of John’s vlogs and Twitter posts from the set. Maybe they will take a look at his other works after they’re done, especially if TFioS is a success. As usual, you have wonderful Top 10 lists. Once you start watching Supernatural and get to the episodes where Crowley shows up, I think you will have found your Crowley for Good Omens. I’m going to watch it at some point. I promise! I’d love to see Paper Towns and A Great and Terrible Beauty too. I enjoyed Scarlet, hope you are as well.